It's been a while since I've joined SupahMommy and MommyBrain for their All About Meme Monday, but this is one topic that I can NOT pass up! And yes, that is my now husband. Junior Prom was a lot of fun. A bunch of us piled into someone's van and went as a group. And just to clarify, "someone" means a person that was part of our group, not a total stranger, which is what that sounds like now that I re-read it. I just don't remember whose van it was. We had to stop at a Wendy's for directions and then try to get out of the parking lot onto the main road without losing the other car that was following us. 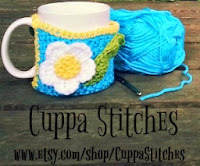 That was kind of tricky! We ate, danced, made fun of one of our friends who wore a suit and old tennis shoes. And we hung out at the pool in the courtyard at the hotel where the dance was. As fun as that night was, that is not the prom I want to talk about. 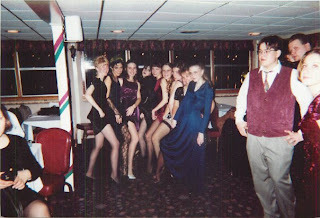 The most memorable school dance for me, and not all in a good way, was Senior Rec. It was kind of like a prom that seniors had every year. It took place on one of the Majestic boats downtown. Again, there was a group of us who went together. That's me in the blue dress. But I did love that blue dress! I look so thrilled, don't I? If you click on the picture you'll get a bigger view. THE REST OF HIS ATTIRE!!!!!! His tie had some sort of wooded scene with an owl on it. How the hell does that go with a tie-dye shirt?!? I was so excited to go to said dance. "Did you see the shirt he wore? Awesome!!!" "Did you see that tie he wore? WTH?" And I would be associated with that. of that poor wardrobe decision. He finds it funny. Still. But I didn't and I never will. 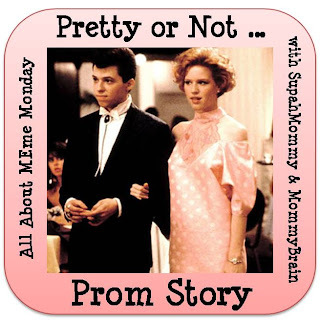 As a hang my head in shame for letting myself be seen in public with my clashing boyfriend, you can head over to SupahMommy and MommyBrain's blogs to read some more funny Prom/Dance stories. 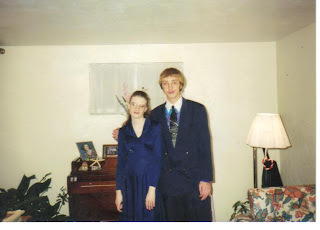 OH I learned at senior prom NEVER trust a man to coordinate himself just NEVER..
YOu look so pissed in that picture. LOL!! You guys are super cute though! Funny story! You do NOT look happy! ha ha! such FUNny memories! HAHAHA Super Cute... and I like the Tye Dye shirt but the Tie... ummm no! You look like you want to run away! Yeah...that tie totally does not go with the outfit. At. All. I hope over the years you have been able to "adjust" his fashion choices! visiting from we believe blogs link up. Oh yes, we've all had those moments but I have to admit that you do look particularly disenchanted with the experience! LOL!! That last pic cracks me up! You look so bored...or something! How sweet that you married your prom date! I'm reading quite a few of those stories today! haha! 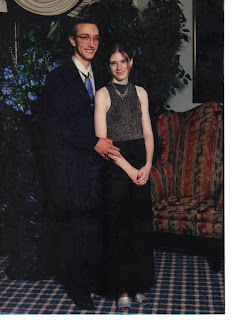 :) Love the old school prom pics. And an owl, huh? That's hilarious.